The NATO handbook is a diagnostic tool to help nations find strengths and weaknesses of their defence and integrity system. 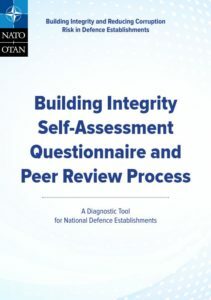 This handbook contains the questionnaire, guidance on organising the process in-country, a sample note that can be used to brief the Defence Minister or Head of the Armed Forces to introduce the process, and an outline of the format of the visit by the NATO review team. The compendium focuses on concepts and tools which can ensure good practices in defence management and policy through integrity building. 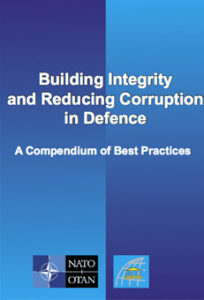 Designed primarily as an introduction and reference tool for defence personnel, civilians in the defence sphere, democratic institutions, and civil society will also find materials on integrity building and anti-corruption measures which are relevant to their own security governance activities.